And the difference from last week is...? This O-line is going to cost us the season. 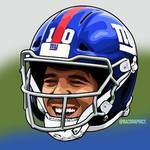 Eli and the offense are brutal to watch. A break from the refs. Detroit won't need it. If we don't draft or sign offensive linemen in the offseason, then someone needs to be fired. This o-line is atrocious. Some of these guys shouldn't even be on the practice squad. Seriously, this is the best we have? Gruden hammering the O line. Good. Need to build pressure for clueless McAdoo and Reese to fix it.